According to Ayurvedic philosophy, choices that we make regarding our daily routine either build up resistance to disease or tear it down. Ayurveda invites us to get a jump start on the day by focusing on morning rituals that work to align the body with nature’s rhythms, balance the doshas*, and foster self-esteem alongside discipline. So while your mind may say you have to check emails, take the dog out, get the kids out of the door, and that you can’t be late for work, or that you just don’t have enough time to cultivate your own morning rituals. In my last blog I talked about a relatively new morning ritual of mine – oil pulling. I happily report, now 3 weeks later, that my annoying cough is gone. Go figure. I notice some other benefits as well, but will save them for another time. Another of my morning rituals, though,for the last 2 or 3 years or so, is to drink a glass of warm water with 1/8-1/4 teaspoon of lemon juice (1/2 lemon). Over time I have heard many of the benefits of this practice, so many that they are just too good to ignore. Here are some of them. 1. Boosts your immune system. Lemons are high in Vitamin C and potassium. Vitamin C is great for fighting colds and potassium stimulates brain and nerve function and helps control blood pressure. 2. Balances pH. Lemons are quite and alkaline food. On their own they are acidic, true, but inside us they’re alkaline and do not create acidity. An alkaline body is an important component of good health. 3. Helps with weight loss. Lemons are high in pectin fiber, which helps fight hunger cravings. It also has been shown that people who maintain a more alkaline diet lose weight faster. 4. Aids digestion. The warm water serves to stimulate the gastrointestinal tract and peristalsis—the waves of muscle contractions within the intestinal walls that keep things moving. 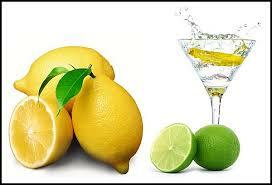 Lemons and limes are high in minerals and vitamins and help loosen toxins in the digestive tract. 5. Acts as a gentle, natural diuretic. Lemon juice helps flush out unwanted materials because lemons increase the rate of urination in the body. Toxins are, therefore, released at a faster rate which helps keep your urinary tract healthy. 6. Clears skin. The vitamin C helps decrease wrinkles and blemishes. Lemon water purges toxins from the blood which helps keep skin clear as well. 7. Hydrates the lymph system. Starting the day on this hydrated note helps prevent dehydration and adrenal fatigue. Lack of proper hydration compromises many body systems, which leads to toxic buildup, stress, constipation, and a host of other ills. The two small adrenal glands which sit on top of your kidneys partner with your thyroid to create energy. They also secrete important hormones, one of which is aldesterone which regulates water levels and the concentration of minerals, like sodium helping you to stay hydrated. They also regulate your stress response. It’s important to treat your adrenals well and avoid dehydration. Lemon water is also much kinder to your adrenals than coffee and other caffeinated drinks, which stimulate them. Try this easy practice for awhile, and be attentive to what changes or doesn’t change for you. I’ve been at it for so long that I can’t pinpoint which benefits I am experiencing more, but I can tell you that if I’ve been away from home for awhile, I am happy to get back to my morning lemon water when I return. It’s just a good start to the day. Let me know how it works for you.